C. J. Hughes, Sr. formed the original company in 1977 when he received his master plumber's license in the City of Cincinnati. He focused the company on repair and remodeling services for approximately 20 years. In 1995, his son Howard Hughes became involved and later incorporated the business to increase business capacity and productivity. The company is currently working to develop third generation leadership. We continued to focus on repair and remodeling by moving the business location to Fairfield, Ohio and acquiring a 6,000 square foot facility. We also began servicing a broader base of customers in the Greater Cincinnati area, which include Hamilton, Butler, Clermont, Warren, and Brown counties and part of Northern Kentucky. We broadened our expertise in water heater and water softener products and became a major installer in the Cincinnati area through corporate accounts, such as Home Depot, Sears, Home Quarters, Builders Square, and Lowes. The company has continued expanding plumbing capabilities in new home construction and light commercial construction. Over the last four years, the company has focused on heavier commercial construction working on schools, recreation centers, transportation facilities, and churches. The company is a certified MBE with the State of Ohio and South Central Ohio Minority SDC and certified SBE with the City of Cincinnati. 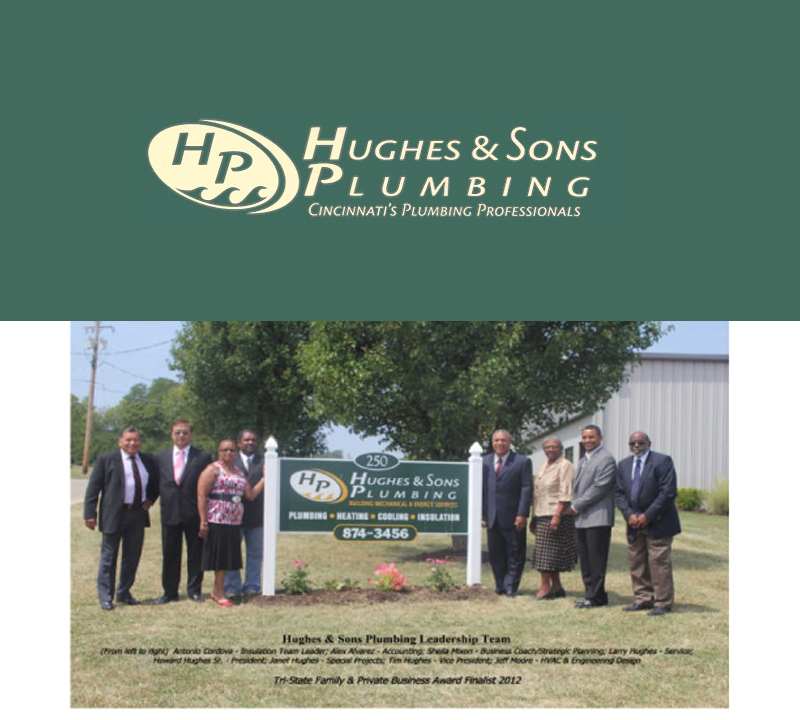 At Hughes & Sons Plumbing, our fundamental tenants were established in 1977 with the Founder who accepted nothing less than excellent customer service and high ethical standards from our management staff and employees. Integrity is the center piece of our philosophy, "When we commit to do a job we deliver". This has built confidence and trust with our customers over the years and helps us negotiate through tough economic times. Two key measures in this area are: A+ rating achieved with the Better Business Bureau for the last ten years; and no unresolved customer complaint for last twenty years. We are active in numerous construction trade organizations, such as: Cincinnati Master Plumbers Association, Urban League, African American Chamber of Commerce, and previously ACI. Our Urban League business coach, Sheila Mixon V. P., entrepreneurship has been very instrumental in helping to develop and implement a relevant Strategic Action Plan. The Strategic Action Plan increased our awareness and improved our focus on key business needs. The new Strategic Action Plan is the most important tool we developed during the last three years helping us to achieve profitability. We were able to reduce our cost and diversify our services on residential and commercial work, including starting a new insulation business segment. The company is currently managed by Howard Hughes, second generation family member, and succession plan is being developed to transfer management to Tim Hughes, third generation family member. Our current focus is to work with key employees and develop career plans that help them improve as individuals and become better equipped to grow the business. We also take pride in having trained seven new African American journeyman plumbers, three state certified master plumbers, one engineer and a number of administrative assistants. Our work continues in this area as we have committed to hire and train a diverse workforce. We have established a diverse board of directors, which includes an attorney, a professional engineer two master plumbers, and an administrative office manager. Their input and expertise has been very valuable.